Buying mineral cosmetics online can be frustrating. The colors are not always true-to-life, and it is hard to view texture. 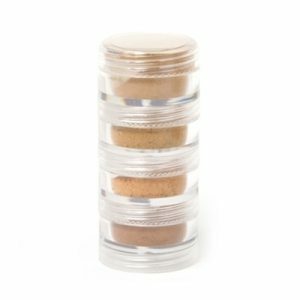 So please take advantage of our discounted and free makeup samples.Each makeup kit for purchase below contains a set of 4 pre-arranged mineral foundation shades in a convenient stack, (enough for several applications). 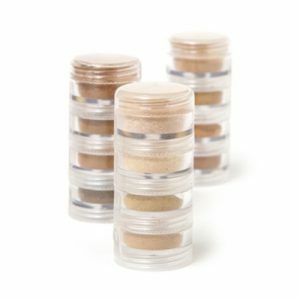 With the purchase of this set, you can choose up to six other complementary powdered samples. Please browse the pages below and note the six free powdered products that you would like by name in the comments area of the shipping page: Choose from Versatile Mineral Powders, Ultra Matte Shadows, Setting Powders, Body Shimmers Illuminizers, Mineral Blushes, and Bronzers. Monave is an inclusive line that represents a broad spectrum of skin tones. Here is a basic chart to get you started. light: For the palest of the pale caucasians who burn easily. medium-dark: for African-Americans with golden, copper or red tones mixed with earthy brown undertones. If you are not sure what shades would look best, and prefer to consult with our on-staff makeup artist, please send us an email, with a photo, and we are happy to help you choose your samples.